Why I live my life solo. When I say I live my life solo I actually mean the exact opposite. I have hundreds maybe a thousand friends across the country that are ready to support me on a whim. Okay, so what does it mean to live my life Solo? It means I compete in SCCA Solo events. Events with 1200 of my best and closest friends from one end of the country to the other. What is a solo event? A Solo event is an exercises in precision vehicle control, performance and handling. Courses ranging between 25 and 80 seconds long are temporarily set-up on old runways, stadium parking lots, mall parking lots and any other expansive piece of asphalt or concrete. These sites are traditionally anything more than 6-8 acres. Each competitor is given the opportunity to walk the course and get familiar with it before driving it. You typically get anywhere between 3 and 6 runs on the course (though some regions and events will give you more). These events range from low pressure practice events and test-n-tunes (typically you can get 25 events or more – essentially run-till-you drop); moderate pressure (regional points events) and high competition events such as Pro Solos, Championship Tours and Match Tours. Along with high pressure high competition events such as the National Championships in Lincoln, Nebraska. A practice event or a test-n-tune are events that are not scored. Usually you can take as many runs as you want. You just have to sign up for a work assignment (typically between 45 and 90 minutes). Some people have managed to take as many as 60 runs on a day! That’s a lot of seat time and enough to make your arms sore! You are also granted the time to make as many changes that you would like to make at these events. Play with alignment, springs, shock settings and sway bar adjustment. Get familiar with what each change does to your car. This is a valuable tool for someone who wants to learn more about the dynamics of their car. A regional “points” event is a scored event put on by your region. Some regions with lower attendances allow you to take as many as 15 runs in a day! With some larger regions that have high event attendance, you may get less than 6. You make your runs and depending upon your performance, you’ll get points towards a year end championship (for region member). Some regions even offer trophies at the end of each individual event. A Match Tour is compromised of a minimum of 9 runs over two days on a single course. After there are qualifying runs for brackets from each heat and then single elimination brackets at the end of day two. Awards and contingency are given out per class along with an over-all awards and contingency for the brackets. This is a great even to step up into for your first national event, lots of seat time and plenty of great people to learn from. These events are fairly low key and full of excitement that you’ll be ready to brag to your friends about. I know I had fun at the one we hosted; we did “March Madness” style brackets pool, which resulted in me being $5 poorer due to my terrible betting skills. A Championship Tour is the next higher level of competition – compromised of 6 runs over two days on two different courses (3 runs per course). They’re broken down into areas. Northern States, Southern States, Central States and so on. You can earn a states championship or trophy, collect contingency and if you don’t manage to win you can still walk away having a great time and collecting stories you’ll tell for years. Don’t be discouraged by its name. ProSolos are not for professionals – it’s simply a name! They combine a traditional course with a drag race start. Two mirrored courses are set up with a drag (“Christmas”) tree as your start and you line up against your competitors – racing head-to-head. Traditionally you get a nice 200 foot straight away at the start and over the course of two days, you’ll get 12 runs (6 on each side). After those runs, each cars time is calculated to determine qualification for bracket racing at the end of the event on day two. If you didn’t qualify for the “Super Challenge”or “Ladies Challenge”, you put your name into a hat for an alternate single elimination bracket called the “Bonus Challenge” (where consistent times are key to doing well). Due to the unique nature of a Solo course and a drag race, it has become arguably the most fun you can have while autocrossing! Now for the top of the heap… The Tire Rack SCCA Solo National Championships. These are all excuses that I have heard over the years and I’m sure I’m missing a few. The reality is the only acceptable excuses are “I can’t get the time off work” and “I can’t afford to go” (and even this can be mitigated with fellow racers who will let you borrow their car, hitch a ride with them and crash on their hotel room floor just to share the Nationals experience with friends). The format is the same as a Championship Tour (6 runs, two courses, 3 runs per course, fastest aggregate time wins)… but who cares about the competition. Let’s focus on the party! I learned a long time ago to make sure I had a drink in my hand. Also, of course when there’s alcohol involved other shenanigans get involved. Is 4 square not your thing? Then hop on your bike or golf kart (or simply walk) down to the Texas compound. They have a small course set up for big wheel ProSolo. The big wheels are the swivel ones, the ones that allow for drifting and getting out control with courses that inevitably intersect allowing you to crash into each other. Which why wouldn’t that be fun? This is done so much during the week that by the end of the week they need new wheels because we’ve destroyed them. The past few years a few people have gotten together to bring a pool and have the fire department fill it, yes a pool. Did I mention it’s on a trailer? A trailer that gets hooked to a truck and moves around the event site? I’ve even seen them take it though the course! Very entertaining! 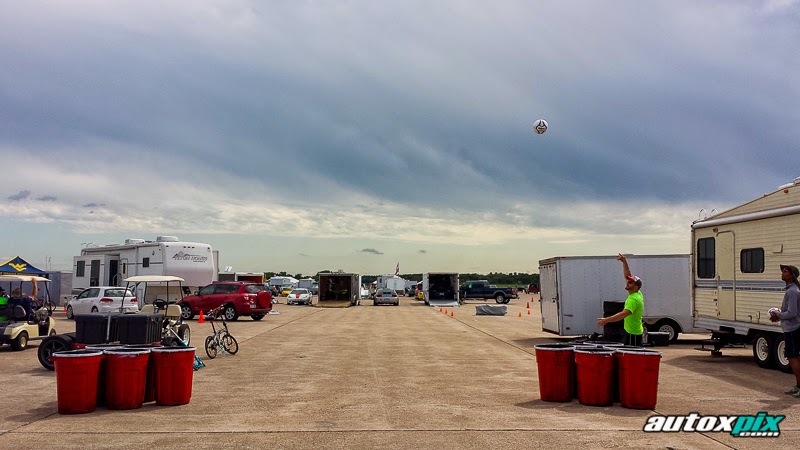 Last year (and I hope they bring it back this year) the Minnesota Region brought garbage cans spray painted to look like giant red “solo” cups and a volleyball to play a giant game of beer pong with. Well the the cans were not filled with beer they had water in them to keep them from blowing around. However the rules stayed the same as regular beer pong you just had to drink your own beer. Which for someone like me who doesn’t like your average light beer this makes it SO much more enjoyable. These things not carrying your fancy? Do you like craft beer? Well you’re in luck. The official German “Biergarten” goes on all week. Bring some local brews (at least a 6 pack) and set them down and take 4 beers you’ve never heard of. I assure you this is worth it. There are people from every state and plenty of beer to go around. Several full coolers with craft beers from all over the country. No matter if you like 4square, Big Wheels, Beer Gardens, karaoke or any other form of partying, the one thing that Nationals has in spades that EVERYONE can appreciate: The camaraderie. Something I like to highlight about Solo is if your car breaks, other drivers will go well out of their way to help you. Whether it is to offer up their car to make sure you get all of your runs, offer up parts and tools or to just down right fix your car – everyone is there to help you have the best experience possible. There have been several instances at the National Championships (and many more at every level of events below it) where a car has broken and their top rivals will show up with the parts and knowhow to fix the broken car and will have it fixed FOR YOU before the next run. This level of sportsmanship is not something you see everywhere and it’s truly special. Unfortunately, the occasions happen where the car is just beyond repair and your competitor may offer to trailer it home for you, either having you drive their car behind you or returning back to the site for their car later. During my first year as a soloist, I did it for competition. Every year after that I returned for the people. These people, all of them, are a very special part of my life. They are family now; a very dis-functional family (at times) that still plays with cars and is always supportive. If it gets to a point where I “graduate” to club racing, which is the goal, I will at least still return to the Solo National Championships every year because the parties and the people are worth every penny it takes to get there. A few examples of returning graduates are Bryan Heitkotter, 2011 GT Academy winner he runs a 370z in The Continental Tire Sports Car Series and a GTR in Pirelli World Challenge. Also, Robert Thorne who drives in the Tudor United Sports Car Series for Flying Lizard Motorsports in their Audi R8 and a McLaren in Pirellli World Challenge. Despite having a professional racing career they still return to SCCA Solo events to keep their skills sharp and enjoy the camaraderie! I live my life Solo and I wouldn’t have it any other way. Hilary Anderson - A solo racer that dumps way too much time and money into a crap box CRX to drive around cones. With experience crewing for Rally America, LeMons/Chump and Tudor teams. With a passion for racing and beer which they seem to go together quite nicely. In that order. If you go the other way the officials tend to frown upon it.